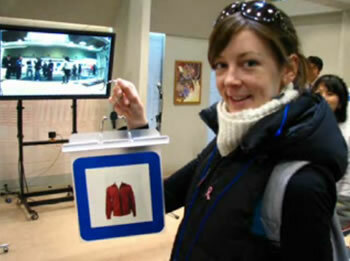 An augmented reality shopping experience is available to shoppers attending the International Next-Generation Robot Fair IRT Japan 2006 — Robot and Information Technology in Osaka, Japan earlier this week. Step One: Select a tag with an item that you would like to try on. Step Two: Walk toward the reader/monitor. It pulls out the information about the item on the tag, and superimposes it on your image. Step Three: Accessorize by pulling out additional tags and matching various items. 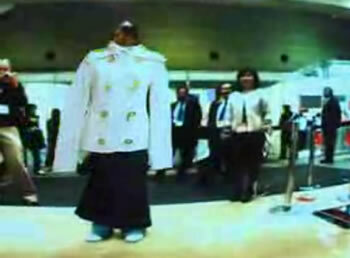 In the picture below, the woman tries on jacket and a skirt. In Vernor Vinge's very cool 2006 novel Rainbows End, people make use of "wearables" - wearable computers that present them with a continuous augmented reality view of the world. In the novel, a person could have accomplished this by looking in the mirror; the wearable computer system augments your view by means of smart contact lenses. 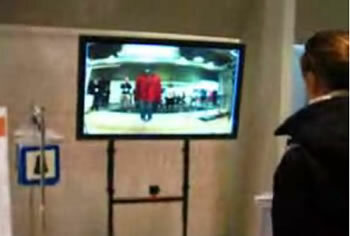 Images snatched from this robot fair video.